Desmond Mpilo Tutu (October 7, 1931 - ) is a South African cleric and activist who rose to worldwide fame during the 1980s as an opponent of apartheid. 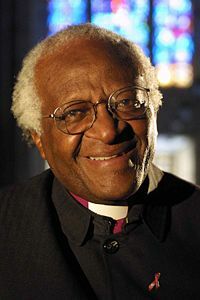 Tutu was elected and ordained the first African South African Anglican Archbishop of Cape Town, South Africa, and primate of the Church of the Province of Southern Africa (now the Anglican Church of Southern Africa). He was awarded the Nobel Peace Prize in 1984, and is also a recipient of the Albert Schweitzer Prize for Humanitarianism. Desmond Tutu is committed to stopping global AIDS, and has served as the honorary chairman for the Global AIDS Alliance. In February 2007, he was awarded the Gandhi Peace Prize 2005, by Dr. A.P.J. Abdul Kalam, the president of India. He was generally credited with coining the term "Rainbow Nation" as a metaphor to describe post-apartheid South Africa after 1994, under ANC rule. The expression has since entered mainstream consciousness to describe South Africa's ethnic diversity. He continues to champion human rights, freedom, democracy and justice. At the invitation of South Africa's first post-apartheid president, fellow Nobel Peace laureate Nelson Mandela, he chaired the nation's Truth and Reconciliation Commission, which was charged with healing the wounds of the past with the power to sometimes give amnesty to those who had violated human rights, or who had even committed murder, as part of the task of building a new, equal, just society. Desmond Tutu born in Klerksdorp, Transvaal, on October 7, 1931. Tutu’s family moved to Johannesburg when he was 12 years old. Although he wanted to become a physician, his family could not afford the training, and he followed his father's footsteps into teaching. Tutu studied at the Pretoria Bantu Normal College from 1951 through 1953, and went on to teach at Johannesburg Bantu High School, where he remained until 1957. He resigned following the passage of the Bantu Education Act, in protest of the poor educational prospects for African South Africans. He continued his studies, this time in theology, and in 1960 was ordained as an Anglican priest. He became chaplain at the University of Fort Hare, a hotbed of dissent and one of the few quality universities for African students in the southern part of Africa. Tutu left his post as chaplain and traveled to King's College London (1962–1966), where he received his Bachelor's and Master's degrees in Theology. He returned to Southern Africa and from 1967 until 1972, used his lectures to highlight the circumstances of the African population. He wrote a letter to Prime Minister Vorster, in which he described the situation in South Africa as a "powder barrel that can explode at any time." The letter was never answered. From 1970 to 1972, Tutu lectured at the National University of Lesotho. In 1972, Tutu returned to the UK, where he was appointed vice-director of the Theological Education Fund of the World Council of Churches, at Bromley in Kent. He returned to South Africa in 1975, and was appointed Anglican Dean of Johannesburg—the first African person to hold that position. In 2000, Tutu received a L.H.D. 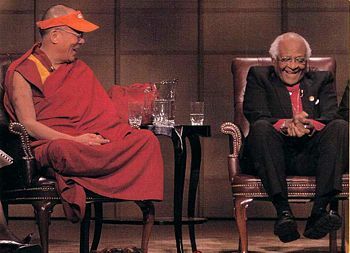 from Bates College, and in 2005, Tutu received an honorary degree from the University of North Florida, one of the many universities in North America and Europe where he has taught. He visited a school at that time, Twin Lakes Academy Elementary School, and spoke to a class of 3rd graders about his work. In 2005, Tutu was named a Doctor of Humane Letters at Fordham University in New York City. He was also awarded Honorary Patronage of the University Philosophical Society by John Hume, another Honorary Patron of the Society and fellow Nobel laureate. He was also awarded an honorary Doctor of Humane Letters by Berea College prior to delivering the commencement address. In 2006, Tutu was named a Doctor of Public Service at the College of William and Mary in Virginia, where he was also the commencement speaker. He was awarded the Light of Truth Award along with Belgian artist Hergé (posthumously for Tintin) by the Dalai Lama for his contribution towards public understanding of Tibet. He has been married to Leah Nomalizo Tutu since 1955. They have four children: Trevor Thamsanqa Tutu, Theresa Thandeka Tutu, Naomi Nontombi Tutu and Mpho Andrea Tutu, all of whom attended the Waterford Kamhlaba School in Swaziland. His family has supported him fully in his often dangerous campaigns, since he has received many death threats, some of which were communicated to his children. In his God Has a Dream (2005), he commented that his wife has been "exposed to a fair degree of harassment that would not have happened had she not been my wife," while his children supported him "despite all the harassment and all the death threats" (92). The 1976 protests in Soweto, also known as the Soweto Riots, against the government's use of Afrikaans as a compulsory medium of instruction in black schools, became a massive uprising against apartheid. From then on Tutu supported an economic boycott of his country. Desmond Tutu was Bishop of Lesotho from 1976 until 1978, when he became Secretary-General of the South African Council of Churches. From this position, he was able to continue his work against apartheid with agreement from nearly all churches. Tutu consistently advocated reconciliation between all parties involved in apartheid through his writings and lectures at home and abroad. Though he was most firm in denouncing South Africa's white-ruled government, Tutu was also harsh in his criticism of the violent tactics of some anti-apartheid groups such as the African National Congress and denounced terrorism and communism. On October 16, 1984, Tutu was awarded the Nobel Peace Prize. The Nobel Committee cited his "role as a unifying leader figure in the campaign to resolve the problem of apartheid in South Africa." Tutu became the first black person to lead the Anglican Church in South Africa on September 7, 1986. In 1989, he was invited to Birmingham, England, United Kingdom, as part of Christian Celebrations marking the city's centenary. Tutu and his wife visited a number of establishments including the Nelson Mandela School in Sparkbrook, Highgate Baptist Church, where the Bishop spoke to a multi-faith audience. His simple but powerful message that "God loves you" attracted large crowds at various venues in the city. After the fall of apartheid, he headed the Truth and Reconciliation Commission, for which he was awarded the Sydney Peace Prize in 1999. In 2004, Tutu returned to the UK as Visiting Professor in Post-Conflict Societies at King's College and gave the Commemoration Oration as part of the College's 175th anniversary. He also visited the student union nightclub named "Tutu's" in his honor, and featuring a bust of his likeness. On March 17, 2004, Tutu visited Marymount to accept Marymount University's 2004 Ethics Award. On November 30, 2006, Tutu was appointed as the lead to a High-Level Fact-Finding Mission mandated by the United Nations Human Rights Council into the Israeli military operations which led to civilian deaths in Beit Hanoun. In the debate about Anglican views of homosexuality Tutu has opposed Christian discrimination against homosexuality. Commenting days after the August 5, 2003, election of an openly homosexual man to be a bishop in the Episcopal Church in the United States of America, Tutu said, "In our Church here in South Africa, that doesn't make a difference. We just say that at the moment, we believe that they should remain celibate and we don't see what the fuss is about." Since then, Dr. Tutu has increased his criticism of conservative attitudes to homosexuality within his own church, equating homophobia with racism and stated that given the problems that Africa faces he thinks it ludicrous that people should focus so much on what people do in bed with whom. Others equally devoted to divine and human compassion decry homosexuality as part of prophetic responsibility and calling. The issue remains controversial in religious and human affairs. The call to define a divine ideal in human relations should not be presumed as uncaring or dispassionate. The Nobel laureate has also expressed support for the West Papuan independence movement, criticizing the United Nations' role in the takeover of West Papua by Indonesia. Tutu said: "For many years the people of South Africa suffered under the yoke of oppression and apartheid. Many people continue to suffer brutal oppression, where their fundamental dignity as human beings is denied. One such people is the people of West Papua." Tutu has also criticized human rights abuses in Zimbabwe, calling Zimbabwean president Robert Mugabe a "caricature of an African dictator," and criticizing the South African government's policy of quiet diplomacy towards Zimbabwe. Tutu has spoken of the significant role Jews played in the anti-apartheid struggle in South Africa, and has voiced support for Israel's security needs and against tactics of suicide bombing and incitement to hatred. Tutu is, nonetheless, an active and prominent proponent of the campaign for divestment from Israel, and has likened Israel's treatment of Palestinians to the treatment of Black South Africans under apartheid. Former U.S. President Jimmy Carter in his Palestine: Not Apartheid (2007) uses a similar comparison of how Palestinians are being treated in the West Bank and Gaza strip with South Africa's treatment of non-whites during the long years of Apartheid. Thank you Mr President for telling me what you think of me, that I am—a liar with scant regard for the truth, and a charlatan posing with his concern for the poor, the hungry, the oppressed and the voiceless (Ben Maclennan, Sapa, 2004-12-02). In February 2006, Desmond Tutu took part in the 9th Assembly of the World Council of Churches, held in Porto Alegre, Brazil. There he manifested his commitment to ecumenism and praised the efforts of Christian churches to promote dialogue in order to diminish their differences. For Desmond, "a united church is no optional extra." Desmond Tutu was named to head a United Nations fact-finding mission to the Gaza Strip town of Beit Hanoun, where, in a November 2006 incident the Israel Defense Forces killed 19 civilians after troops wound up a week-long incursion aimed at curbing Palestinian rocket attacks on Israel from the town. Tutu planned to travel to the Palestinian territory to "assess the situation of victims, address the needs of survivors and make recommendations on ways and means to protect Palestinian civilians against further Israeli assaults," according to the president of the UN Human Rights Council, Luis Alfonso De Alba. Israeli officials expressed concern that the report would be biased against Israel. Tutu canceled the trip in mid-December, saying that Israel had refused to grant him the necessary travel clearance after more than a week of discussions. A spokesman from the Israeli foreign ministry indicated that no final decision had been made, to which Tutu responded, "At times not making a decision is making a decision. We couldn't obviously wait in limbo indefinitely." "When missionaries came to South Africa, we had the land, they had the Bible. Then they told us, 'Let's close our eyes and pray.' When we opened our eyes we saw that we have the Bible, they have the land." Despite sometimes being regarded as more of a political activist than a Christian leader, theology informs everything that Tutu does. He has developed a type of theology based on the African concept of "ubuntu," which refers to human interdependence. God created us, says Tutu, as a single human family. For him, "social harmony … is the summum bonum—the greatest good" (2005: 27). Akk are related to the whole of "creation" and "stewards" of "all of its glory and physicality" (28). Ubuntu does not say, "I think therefore I am" but "I am human because I belong, I participate, I share." It subverts the idea that success by any means is permitted, such as "succeeding at the expense of others" (27). Ultimate freedom is to be found in a human unity that recognizes no barriers, so that "We can be human only together, black and white, rich and poor, Christian, Muslim, Hindu, Buddhist, and Jew" (27). Tutu has had a warm relationship with leaders from faith communities other than his own. In August 2006, Archbishop Tutu publicly urged Jacob Zuma, the South African politician who had been accused of sexual crimes and corruption, to drop out of the ANC's presidential succession race. Zuma's personal adviser responded by accusing Tutu of having double standards and "selective amnesia" (as well as being old). Elias Khumalo claims the archbishop “had found it so easy to accept the apology from the apartheid government that committed unspeakable atrocities against millions of South Africans,” yet now “cannot find it in his heart to accept the apology from this humble man who has erred.” Tutu and Zuma’s public criticism of each other are reflections of a turbulent time in South African politics. In an article published in the Ecumenical Review (Oct. 2003) B.J. de Klerk describes Tutu as, alongside Nelson Mandela, an "icon of reconciliation" and an inspiration to many millions of people around the globe. Tutu, he writes, "is a man who rejoices in the human spirit. His optimism as a devoted Christian, belief in the triumph of good over evil and the remarkable strength of the human spirit help him to overcome the different struggles in his life.". Despite all his honors, Tutu remains at heart a humble priest and servant. He tells how, while flying one time, a passenger mistook him for Bishop Abel Muzorewa when they asked an air hostess to request his autograph; "I tried to look modest, although I was thinking in my heart that there were some people who recognized a good thing when they saw it. As she handed me the book and I took out my pen, she said, 'you are Bishop Muzorewa, aren't you?'." "That certainly," writes Tutu, "helped keep my ego in check." On the day that the prisoner who became President was released, Mandela said of Tutu, "Here is a man who had inspired an entire nation with his words and his courage, who had revived the people's hope during the darkest of times." ↑ The Star, Dalai Lama to honour Tutu, Tintin. Retrieved May 2, 2007. ↑ The Norwegian Nobel Committee, The Nobel Peace Prize for 1984. Retrieved May 2, 2007. ↑ Gay.com, Desmond Tutu: gay bishop row is just "fuss." Retrieved May 2, 2007. ↑ 4.0 4.1 Desmond Tutu, Apartheid in the Holy Land, The Guardian. Retrieved May 2, 2007. ↑ Jacob Slosberg, Tutu to head UN rights mission to Gaza, Jerusalem Post. Retrieved May 6, 2007. ↑ Gil Hoffmann and Herb Keinon, Israel delays UN Mission to Beit Hanun. Retrieved May 6, 2007. ↑ Zukile Majoua, Zuma camp lashes out at 'old' Tutu. Retrieved May 6, 2007. ↑ Desmond Tutu, God Has a Dream: A Vision of Hope for Our Time (New York: Doubleday, 2004), 82. ↑ Nelson Mandela. Long Walk to Freedom: The Autobiography of Nelson Mandela (Boston: Little Brown & Co, 1995), 678.
du Boulay, Shirley. Tutu: Voice of the Voiceless. Grand Rapids, MI: Eerdmans, 1988. ISBN 9780802836496. Battle, Michael. Reconciliation: The Ubuntu Theology of Desmond Tutu. Cleveland, Ohio: Pilgrim Press, 1997. ISBN 978-0829811582.
de Klerk, B. J. "Nelson Mandela and Desomond Tutu: living icons of reconciliation." 323-334 The Ecumenical Review (Oct 2003) ISSN 0013-0796. Gish, Steven D. Desmond Tutu: A Biography. Westport, CT: Greenwood Press, 2004 ISBN 9780313328602. Hein, David. "Bishop Tutu's Christology." Cross Currents 34 (1984): 492-499. Hein, David. "Religion and Politics in South Africa." Modern Age 31 (1987): 21-30. Mandela, Nelson. Long Walk to Freedom: The Autobiography of Nelson Mandela. Boston: Little Brown & Co, 1995. ISBN 0316548189. Nobel lecture, 11 December 1984. This page was last modified on 25 October 2017, at 19:15.